We have encountered what can only be called a typical British summertime over the last few days! Of course, this means that rain has been quite abundant. When this happens, and it happens a lot, I usually resort to shooting something indoors to get my weekly photography fix. However, having not spent as much time recently with my camera as I'd have liked, this week I was determined to get outside and shoot some insect life. Despite the rain, it has remained quite warm, so I was hopeful of finding some sort of quarry! After ramping up the ISO to counteract the poor light filtering through the dark clouds, and fixing a lens hood to my macro lens in an attempt to keep rain off the front glass, I stepped out into the wetness, and started my bug hunt. Unfortunately, every bug, fly and creepy crawly seemed to be in hiding, sensibly sheltering from the rain. The only wildlife seemingly stupid enough to brave the downpour was me! 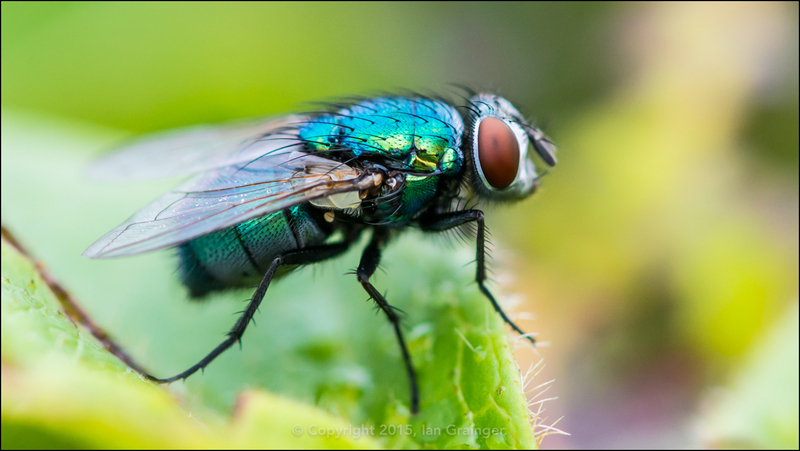 After twenty minutes of searching I was decidedly wet, and was heading back indoors, when this little Greenbottle fly (Lucilia caesar) caught my eye. Thankfully it decided to stay still and let me snap a few quick shots before I made my way back into the dry.